ADAMS COUNTY, Colo. -- There's a place just outside Denver in unincorporated Adams County giving non-producing farm animals a second chance at life. But, it's been a rough winter. 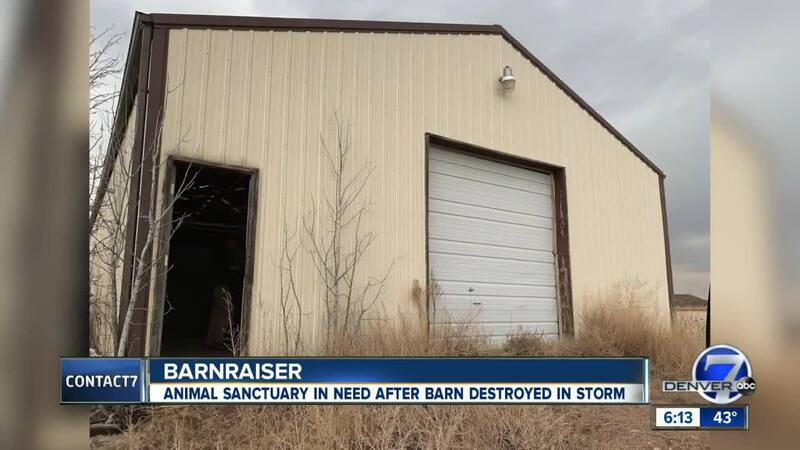 Broken Shovels Farm Animal Sanctuary lost a barn in last month’s ‘bomb-cyclone' and now the nonprofit is reaching out to the public for help rebuilding as they continue to get new arrivals every day. In fact, they took in two new baby calves just Friday. The male calves, Ulysses and Perseus, were rescued from a dairy farm in California. "These calves coming out of that situation are always very fragile,” said Broken Shovels owner Andrea Davis. “They often don't get the milk that they need." Broken Shovels is home to about 200 large animals and another 200 chickens and other birds. "We are a home for rescued, neglected, abused and slaughter-bound farm animals," Davis said. “And losing the barn was a big loss. The frame of it just crumpled in those high winds." Now, there's a gravel mine just down the road willing to donate barn, as long as Broken Shovels can figure out a way to transport it. "They bought a piece of land that has a huge, beautiful pole barn on it and of course, they're going to be mining it, so they just need it gone," Davis said. “The main thing is raising the costs of the heavy equipment we'll need to take the truces down." If you’d like to help, you can donate here on the Broken Shovels web and Facebook pages.